Louise Anna (left) and David Allen Turpin are each being held on $9 million bail. PERRIS, Calif. — A 17-year-old girl called police after escaping from her family’s home where she and her 12 brothers and sisters were locked up in filthy conditions, some so malnourished officers said at first believed all were children even though seven are adults. The girl, who was so small officers initially believed she was 10, called 911 and was met by police who interviewed her and went to the family home in Perris, about 70 miles southeast of Los Angeles. 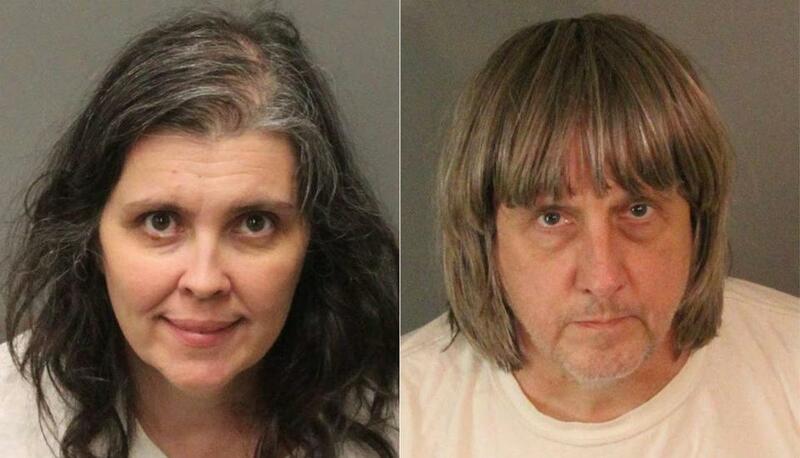 They found several children shackled to their beds with chains and padlocks in dark, foul-smelling surroundings, according to the Riverside County Sheriff’s Department. The children, ages 2 to 29, ‘‘appeared to be malnourished and very dirty,’’ according to a press release announcing Sunday’s arrest of the parents. David Allen Turpin, 57, and Louise Anna Turpin, 49, each were held on $9 million bail and could face charges including torture. State records show the family home has the same address as Sandcastle Day School, where David Turpin is listed as principal. In the 2016-17 school year it had an enrollment of six. ‘‘They didn’t say a word,’’ he said. ‘‘We remember them as a very nice couple,’’ Trahan said, adding that Louise Turpin told him the family loved Disneyland and visited often. The home where police arrested a couple accused of holding their 13 children captive in Perris, Calif.